More than 1800 children aged between one month and six years old languish in Indian jails, growing up with their imprisoned mothers. The plight of these guiltless children has long been known in India, but recent investigations by a human rights lawyer in the state of Odisha, on India’s eastern coast along the Bay of Bengal, has again thrust the problem into the national spotlight. The lawyer, Biswapriya Kanungo, successfully applied this month for the release of official documentation about the status of women prisoners and their children. Kanungo received a report from Odisha’s Directorate of Prisons and Correctional Services detailing the plight of 46 children – 25 girls and 21 boys, all under six years old – held with mothers sentenced for various crimes. Children lodged in jails with their mothers are neither convicts nor [awaiting] trials. They are entitled to food, shelter, medical care, clothing, education, and recreational facilities. Allowing children to grow up in small cubicles in prisons has triggered serious debate. 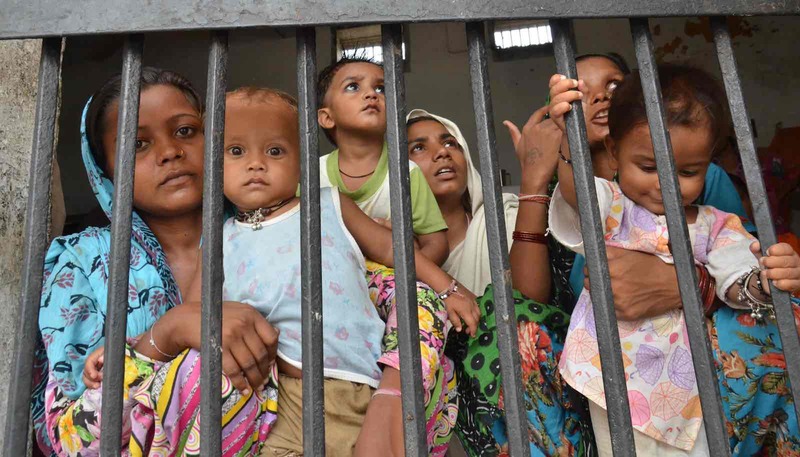 Until the age of six, children are allowed to live with their imprisoned mothers in India. Many develop without getting the attention they need, suffer a loss of health, and are isolated from the outside world. Some incarcerated children are old enough to attend school, but instead remain invisible victims of crime, their rights violated, deprived of social and emotional security not only by the criminal activities of their parents but also the state’s actions in the name of justice. Children below three years shall be allowed crèche and those between three and six years shall be looked after in the nursery. The prison authorities shall preferably run the said crèche and nursery outside the prison premises. The guidelines go further, acknowledging that holding children with convicts sentenced for all types of crime, including violent crime, is “certainly harmful”; that authorities should ensure facilities for the “proper biological, psychological, and social growth” of children; and that the cases of female prisoners with children should be expedited. Sadly, the reality is different. Often women prisoners with children remain in jail simply because no one can provide the sureties required to free them on bail, or their terms are extended due to lackadaisical prison administration. Jails are overcrowded and there are few allowances, such as a separate diet or baby care items, for women imprisoned while pregnant or breastfeeding. The blame is shared across several levels of government. The prison system is administered by state governments, subject to federally enacted laws including the archaic Prisons Act (1894). Prison overcrowding leads to ballooning expenditures and overshooting of sanctioned budgets, leaving little opportunity for change. Following an investigation and Supreme Court ruling in 2006, minor amendments have been made to the way women prisoners with children are treated. While some prison departments now provide fortified foods as well as crèche and nursery services, many convict mothers are nervous about sending their children to these facilities. Nor do such incremental developments allay the wider problem. Despite the limited public funds and other hurdles, several non-governmental organisations have sought to improve the lives of children in prisons, providing them with, for example, a smooth transition from jail crèche facilities to residential schools. In some states, the government has brought in NGOs to support impoverished prisoners. But again, these are stand-alone efforts with limited funds and will not transform the jail system. And enlisting the help of foreign NGOs seems unlikely after several have been kicked out by the Indian Government. Children are innocent and deserve better. There is no dearth of rules and regulations issued by the Supreme Court; however, without vigilant implementation of the guidelines and directives, the mission to save these orphans of justice languishing in prisons will remain a distant dream.